10 rigorous, forward-looking, student-crafted strategies to address urgent challenges. Foresight Prep @ Oberlin seeks transformative student learning outcomes across five major areas: insight into sustainability; leadership development; diversity; college and career preparation; and the formation of a network to support students' future education and career paths. 96% of students agreed the program helped them better understand and articulate their leadership potential. 100% of students treasured the relationships they formed with peers, faculty, and sustainability-oriented leaders, the seeds of a network that will prove indispensable in their future change-making endeavors. Foresight Prep @ Oberlin prioritizes experiential learning through inspiring and enlightening interactions with real-world sustainability practitioners. Students interviewed a wide range of leaders, from corporate executives to social entrepreneurs, labor organizers, researchers, and policy-makers, as well as representatives from entities promoting corporate social impact reporting, community development organizations, urban planning offices, alternative energy projects, and Oberlin College. 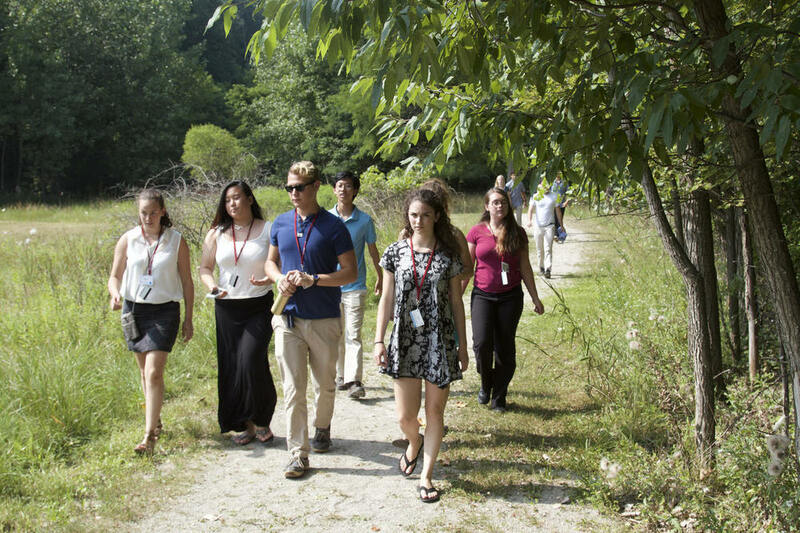 Students toured agricultural and neighborhood development projects in urban and rural areas, water and energy facilities, and a land conservancy, amongst others. On campus, students engaged in classroom discussions that provided context for their experiences in the field, while deepening their understanding of complex systems and leadership development principles. A range of learning modes were employed to keep students on their toes, includings systems diagramming activities, facilitated small group breakout discussions, and inspiring lectures. Students applied their newfound knowledge about effective strategies for pursuing greater sustainability through business to the creation of their own businesses, then entered the "Sustainability Shark Tank" to pitch their plans to an audience of potential investors. Businesses included an upcycling-oriented arts education enterprise; a more robust bike co-op for the town of Oberlin; a used sporting goods store promoting health and recreational opportunities for young people; and an incubator for cooperatively-owned e-commerce platforms to rival sites like Etsy and Ebay, while returning profits and decision-making power to the artists and entrepreneurs who generate the most value for the sites. Students designed interventions that leveraged the power and influence of particular entities in the food system (e.g. farmers, corporations, consumers, policymakers, etc.) toward the creation of more optimal farming, distribution and waste management practices. Projects included a "food waste CSA" that would reduce industrial food waste, while addressing urban food security, transportation and employment challenges; an urban agriculture and education organization in Chicago; and a campaign to leverage youth networks to help accelerate a farmworker organizing effort that is currently underway to demand more just labor practices within Ben & Jerry’s dairy supply chain. Students used an urban planning-based approach to develop transformative ideas for the future of water, land and energy in Northeast Ohio, considering the potentially conflicting interests of diverse stakeholders. Strategies included a comprehensive regional green infrastructure plan to address stormwater and agricultural runoff and combined sewer overflow; an initiative to engage low-income communities in Cleveland sustainability efforts; and a plan to reverse urban sprawl and revitalize the city of Cleveland through revised regional tax codes and investments in more sustainable infrastructure. At the conclusion of each program, supported by public speaking and presentation training from Foresight Prep faculty, students presented their final projects to attendees who acted as potential funders or key stakeholders. Audiences included Oberlin College President Marvin Krislov, representatives from the Oberlin Project, an integrated community development organization focused on building the low carbon economy; Oberlin College Admissions; the Bonner Center for Service and Learning, who manage the College's community service and engagement programs, and the Oberlin College Environmental Studies faculty and staff, amongst others. They each provided feedback and insights critical for students' growth. Interested in helping catalyze the next generation of impactful, transformative sustainability-oriented leaders? SIgn up for the Foresight Prep email list to receive updates on 2016 summer programs, and contribute to our fund to enable greater participation of low income and students of color.